I’ve now taught close to two hundred curious knitters how to weave, and what a joy it is. In fact, my weavers return year after year because the possibilities on the friendly loom I provide are endlessly inspiring. 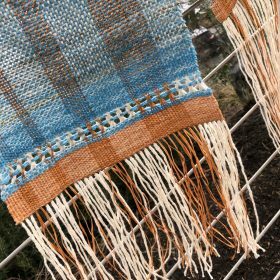 Weaving is much faster and easier to learn than knitting and opens inspiring new vistas for knitters. Everyone so far has been warped and weaving before lunch on the first day. I provide an endless supply of cotton yarn for learning so that exploration is free and fearless. After a few hours of practice with selvedges and trying out a few textures, individuals choose from the patterns I provide or simply dive in with their own creativity. Weaving welcomes odds and ends in a way that knitting cannot, so you’ll return home with a new appreciation for your stash. 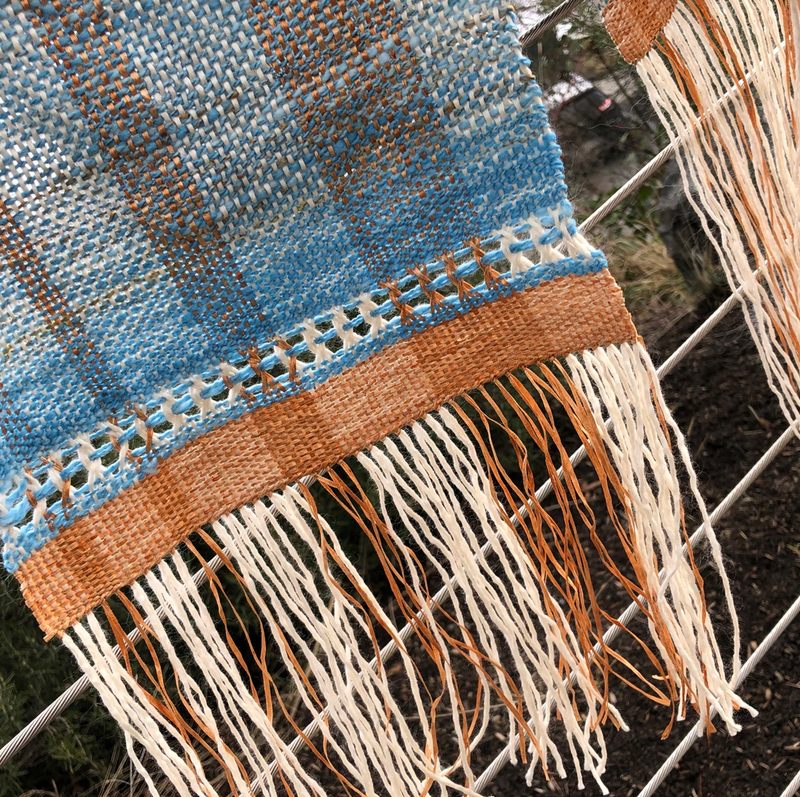 Garments that combine weaving and knitting come together so much faster—you’ll learn to knit smoothly off any woven edge or surface, and will see examples of hybrid garments. To learn and see much more, download 2020 IWKR PDF, and email me with any questions, or to reserve a spot for yourself (and perhaps a friend). Come join the fun! I particularly love doing these retreats and sharing the beauty of the island where I am so fortunate to live. San Juan Island is closer to British Columbia’s Vancouver Island than it is to mainland USA, and those of us who live here consider it paradise. Our retreat home is the serene and sparkling Island Inn at 123 West, about a minute’s walk from the ferry. you can even spend an afternoon cruising on the interisland ferry, circling amongst the four ferry-served islands while you knit or weave. Island Wools, our local yarn shop, is just a two-minute walk if you suddenly need something. To learn about the lodging choices, download 2020 Island Inn Room Guide. Our gathering space looks out on neighboring islands and on into the wild blue yonder. Imagine sipping your morning coffee and watching the sun rise over Brown Island, painting the sky like a beautiful rose-gold skein of cashmere! Afternoons are free for exploring the island. You can stroll about the village or the waterside park, visit the Whale Museum, wander the network of docks and fantasize about life aboard, walk along quiet forested roads, or rent a bike and intimately explore the island’s byways. Or savor a sweet afternoon nap in your ultra-soft sheets! There are alpaca farms, hiking trails, beaches, an outdoor sculpture museum, harbor seals, and more.